News coverage usually focuses on the most recent events, and when we first launched quotes, we did the same. However, past events frequently provide context that helps us better understand the present. 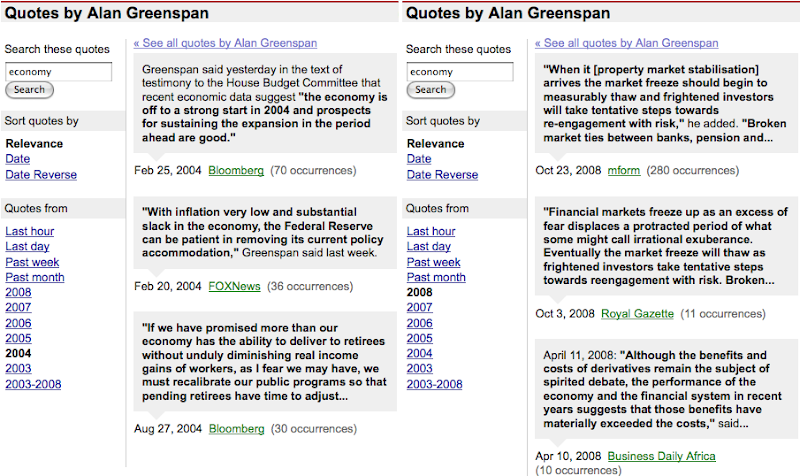 With this in mind, we recently extended our quotes coverage back to 2003. Hopefully this new data (our quotes index grew 15x in size!) will help shed light on what people have thought and said over time, and how their views have changed. Of course, quotes are not restricted to politics--there are also many from sports figures. See what Michael Phelps said about the 2004 and 2008 Olympic games, or what Roger Federer has been saying about Wimbledon.